How a New Deal senator’s anti-monopoly investigations changed American business. 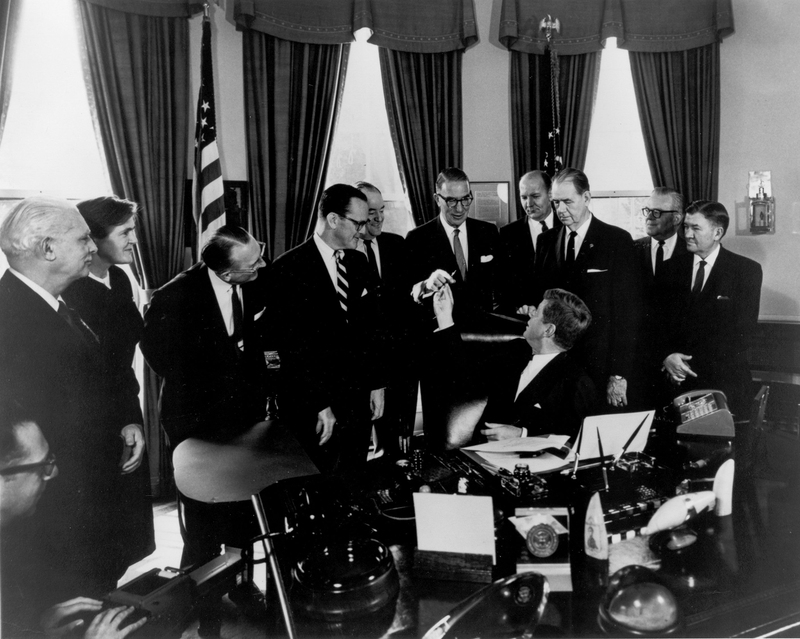 President John F. Kennedy hands Senator Estes Kefauver the pen he used to sign the 1962 Amendments to the 1938 Federal Food, Drug and Cosmetic Act. Wikimedia Commons, U.S. Food and Drug Administration. In August 1957, Senator Estes Kefauver, chair of the Senate Subcommittee on Antitrust and Monopoly (established in 1951), grilled U.S. Steel president Roger Blough in room 457 of the Old Senate Office Building. The previous month, the steel industry had announced a $6-per-ton price hike. Kefauver: Mr. Blough, do you regard it as true competition when another company matches your price to a thousandth of a cent per pound…Wouldn’t it be more competitive if there were at least some slight difference in these prices? Blough: I would say that the buyer in that situation has this choice. He chooses to buy from one company at $5 higher. He chooses to buy from our company at $5 lower. Now if you call that competition and a desirable form of competition, you may have it your way. I say the buyer has more choice when the other fellow’s price matches our price. Kefauver: That’s a new definition of competition that I have never heard. The testimony of Blough and fellow steel executives solidified the New Deal Democrat’s reputation as a monopoly hunter. To understand and, ideally, ward off what Supreme Court Justice Louis Brandeis called the “curse of bigness,” Kefauver corralled Blough and others to assess the role of administered prices—prices that firms set internally, not through market forces such as supply and demand—in the rising cost of living. The progressive, coonskin-cap-wearing senator from conservative Tennessee saw the lack of market controls as “a built-in immunity to the forces of the market” that benefited industry, not consumers. The time was ripe to reflect on the power of big—and growing—businesses. 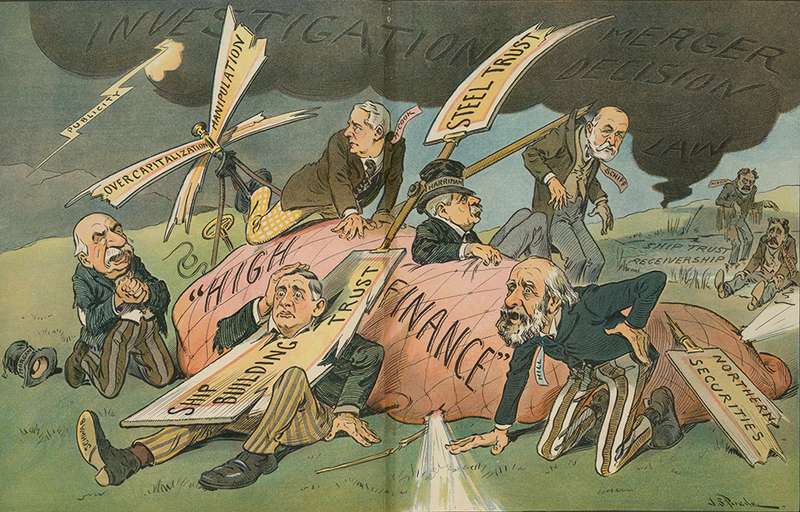 Seven years earlier the senator had passed the 1950 Celler-Kefauver Act, which closed asset loopholes for horizontal mergers that eclipsed Section 7 of the Clayton Antitrust Act of 1914. The legislation prevented executives from buying the assets of companies they wanted to acquire. It was an update of the Sherman Act of 1890, which prohibited contracts, combinations in the form of a trust, and conspiracy in restraint of trade. Chief Justice Earl Warren later wrote that the Celler-Kefauver Act was intended to stop the “rising tide of economic concentration in the American economy.” Yet the legislation indirectly encouraged the growth of conglomerates because court battles over the act led to Supreme Court decisions that watered it down. The chairmen of the nation’s biggest companies, including Bethlehem Steel, Chrysler, Ford, General Electric, General Motors, Merck, and Standard Oil, gave dramatic testimony at the hearings. Dozens of economists, including former Fortune editor and Harvard University professor John Kenneth Galbraith, testified as to whether price increases led to inflationary markups and higher margins. The press regularly covered the subcommittee both as serious inquiry and as theater. Kefauver was portrayed as a maverick pitted against the likes of Blough. 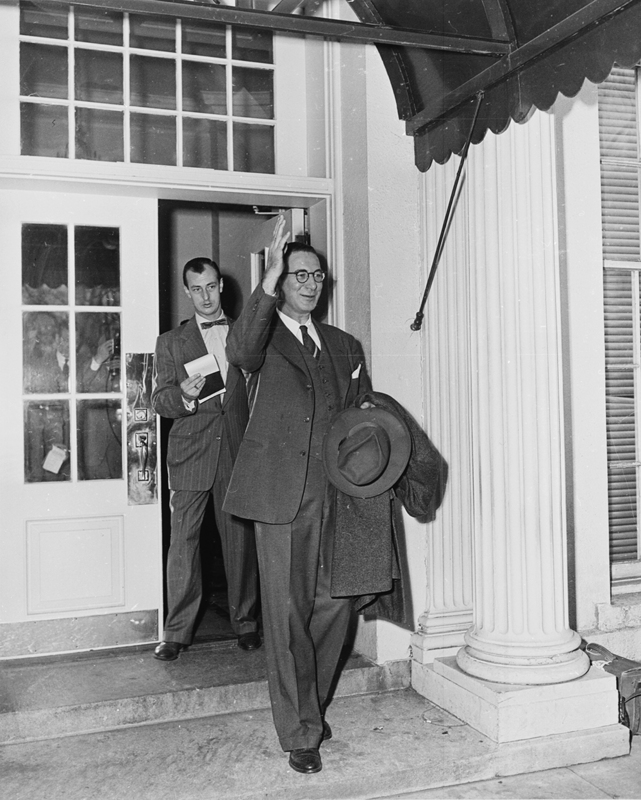 Despite a number of adversaries who tried to quash him at every opportunity, a segment of the public adored Kefauver, who, as a presidential candidate in 1952, was the first to beat an incumbent president in a New Hampshire primary. The hearings drew a celebrated list of witnesses. Eleanor Roosevelt gave evidence on hearing-aid manufacturers. Sonny Liston, Mickey Mantle, and Ted Williams testified about monopolies in boxing and baseball; at the time both had a reserve clause preventing players from working for different teams during their contracts. In a telegram to Representative Emmanuel Celler, chair of the subcommittee’s House counterpart, Frank Sinatra testified that he moved to Capitol Records after an executive at Columbia Records had presented inferior songs controlled by BMI, later deemed a monopoly, instead of songs from the American Society of Composers, Authors, and Publishers catalogue. “It is my earnest hope that your investigations will result in the curbing of practices which create restraint and take from the artist those creative freedoms which are so necessary to his talent,” he wrote. The subcommittee’s first test was steel. Essential to the construction of aircraft carriers, bridges, buildings, and other hallmarks of modern society, the steel industry wielded hefty power in private-sector deals and government contracts. For Kefauver, it was an ideal target for his inaugural monopoly investigation. When steel companies colluded, everything from canned beets to cars was more expensive. During recessions, when there is less demand and fewer orders for refrigerators and other large consumer goods, jobs and profits fall. For executives, the union-supported wages they considered a burden were a pretext for agreeing with competitors to set prices. Without government or court interference, consumers and businesses were forced to pay whatever prices executives, rather than the market, decided. The Eisenhower administration initially sided with steel. The Federal Trade Commission found there was no price-fixing in the steel industry because it had not violated the specific terms of a 1951 consent order barring collusive price-fixing. (In 1947 the FTC charged the major steel producers with using a pricing formula to suppress competition, which led to a 1951 settlement requiring them to cease conspiratorial pricing.) In August 1958, Kefauver sent a written request to the president asking that the country “formulate a wage-price program” to combat the steel inflation problem, which he estimated would cost buyers $285 million. But President Dwight D. Eisenhower refused to ask Congress for the power to fix prices and wages. When the subcommittee subpoenaed Blough and his counterparts again in 1962, some refused to comply. But Kefauver’s anti-monopoly, pro-consumer rhetoric did not fail to resonate. The senator’s antitrust drumbeat was a steady thorn in the side of industrial heavyweights such as Blough for the first time since President Theodore Roosevelt’s trustbusting. His inquiries pointed out the perils of letting big business go wild amid tepid regulatory oversight, and the experts he assembled for his hearing, which took place in the early television era, shaped the public conversation for decades. The hearings illustrated the back-and-forth of regulatory victories and how power shifts in government distort the pace of progress. Indeed the subcommittee’s failures, stalemates and backlashes were foiled in part because Kefauver was playing a long game that persisted long after his death. Kefauver and John Blair, the subcommittee’s chief economist, had insight into the contours of capitalism, specifically how unregulated markets that ignored consumer interests could lead to inequality. 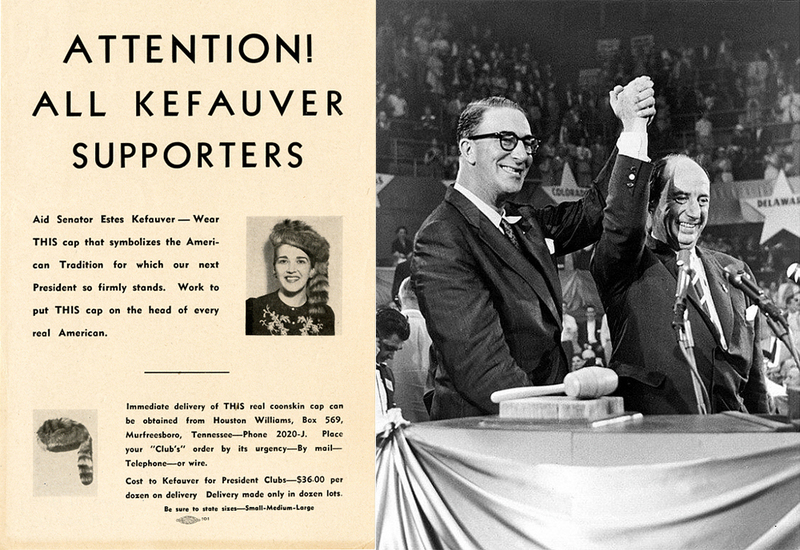 Kefauver, a 1952 presidential candidate and 1956 vice presidential candidate, was especially skilled at drawing attention to the dangers of unchecked capitalism. In 1957, when he announced his inquiry into administered prices, he used radio, television, and print media to decry the higher cost of living in the face of falling demand and a tepid administration. Blair, an expert on oil, was the brain behind the committee’s analysis of price rigidity—analysis that would become the foundation for arguments in price-fixing cases for decades. He lamented the end of the postwar “normal sellers’ market,” with less economic concentration bringing flexible prices. A lack of new markets and less expansion stalled consumer growth, due to “vanishing frontiers,” as he wrote in Seeds of Destruction (1938), a meditation on the functional weaknesses of capitalism. As a result, “the producer is tempted, if not forced, to adopt the mechanism of price-fixing and restricting production rather than relying upon selling his goods at low prices to a large market.” Their prescriptions included breaking up giant corporations to promote competition and encouraging the growth of new companies. Kefauver criticized the Eisenhower administration’s policy of fiscal discipline that “all but obliterat[ed] sources of capital” for growing businesses by insisting on balanced budgets, higher interest rates, and tightening the supply of money, credit, and public spending. In 1951, a year after the Celler-Kefauver Act was enacted, the Supreme Court ruled in favor of Standard Oil that an increase in price made in good faith to meet the competition was a legitimate defense against price-fixing. The ruling came during a transitional period when inventive technologies began to create new areas of commerce and increased efficiency. Larger companies started to acquire smaller ones, leading to a rise in concentration of economic power. Price-fixing was ubiquitous—so much so that Kefauver urged government to rein it in, lest consumers be forced to subsidize businesses that eventually would consolidate. Price-fixing helped bolster the monopoly power steel and other industries already possessed. Not all were swayed by Kefauver and Blair’s portrait of the economy; criticism from obvious antagonists of the subcommittee was brutal during the hearings. Pro-monopoly advocates argued that the senator’s solutions for reining in giants weren’t practical and would create additional problems like massive cost inflation and even the end of the free-enterprise system. The Chamber of Commerce asked whether the subcommittee’s data “could be made to serve the aims of political propaganda.” Republican William Knowland proposed cutting funds for the subcommittee by nearly a third, from $365,000 to $250,000 and was supported by Senator Prescott Bush, but the effort failed. There is no longer a constant diffusion of a nation’s growing wealth into a larger number of hands because a large and evidently increasing number of persons can find no place where they can make a living. This means that the nation’s wealth if it increases goes into the hands of the very same persons who received it when the frontiers closed. When Rogers wired Kefauver for a response, Kefauver cheekily replied that he hadn’t read Blair’s book, but that conservative book reviews had commended it and that “the only unfavorable review it received was in the Daily Worker.” Kefauver, who was not anti-business, said that antitrust laws protected businessmen. Amid this cacophony of opinions, the hearings rolled on—and on. After interrogating the steel industry, the subcommittee moved on to grilling executives in automobiles, drugs, and baking on monopolistic behavior. The questioning went on for years. By 1959 the hearings had evolved into the country’s first robust public debate over inflation. Galbraith disagreed with Kefauver that breaking up big corporations would prevent price inflation. Instead of antitrust prescriptions, Galbraith favored legislation that would require government hearings before a price increase could be enacted. The danger of inflation can be made a powerful argument against things which are opposed on generally conservative grounds…The price of more spending on education, health, defense, foreign aid, or conservation, is, it will be said, more inflation. So to the man who opposes the expansion or improvement in these activities, the person who favors some or all, becomes automatically a spender and an inflationist. But industries could not continue raising prices indefinitely in the face of lessened demand. Suddenly, Eisenhower changed his tune, saying that steel and auto hurt themselves and the economy by regularly raising prices. In 1959, Eisenhower appointed Robert Alan Bicks as acting head of the Department of Justice’s Antitrust Division. “A rock-solid conservative believer in an unfettered, competitive market,” according to the New York Times, Bicks was an unlikely ally of Kefauver. Yet he wound up filing scores of criminal and civil actions against businesses. It was the biggest spate of litigation undertaken by the division since the New Deal and solidified an apparatus to enforce laws against price-fixing and other anticompetitive behaviors. Grand juries were impaneled to investigate “undue concentration” in the steel and auto industries. Bicks supervised a criminal antitrust case against GE, Westinghouse, and twenty-seven other electrical equipment makers, as well as forty-five executives accused of rigging bids and fixing prices. Some pled guilty, while others pled no contest. Bicks also moved to block DuPont-GM and Bethlehem Steel–Youngstown Sheet & Tube mergers. He opened an investigation into GM’s monopoly of the railroad locomotive market, though the case was later dismissed. President John F. Kennedy’s administration would continue to keep a watchful eye by standing up to the steel industry and launching investigations. For the most part, Kennedy did not want to alienate the business community, whose support he needed to govern effectively. But he leveraged the stage set by Kefauver when it served his interests, as in his standoff with steel producers in April 1962. After Blough arrived at the president’s office to announce a price hike, Kennedy reversed the steel industry’s plan to raise prices, as it violated an industry agreement with labor and the government to restrain wage and price increases. The New York Times reported that secretary of labor Arthur Goldberg had told the president “the price increase…would jeopardize the government’s entire economic policy [and] the interests of U.S. Steel.” Goldberg argued the price hike would weaken collective bargaining and lead to a new wage-price spiral that would curb economic growth, keep unemployment high, lower export sales, weaken the dollar, and interfere with the outflow of gold. 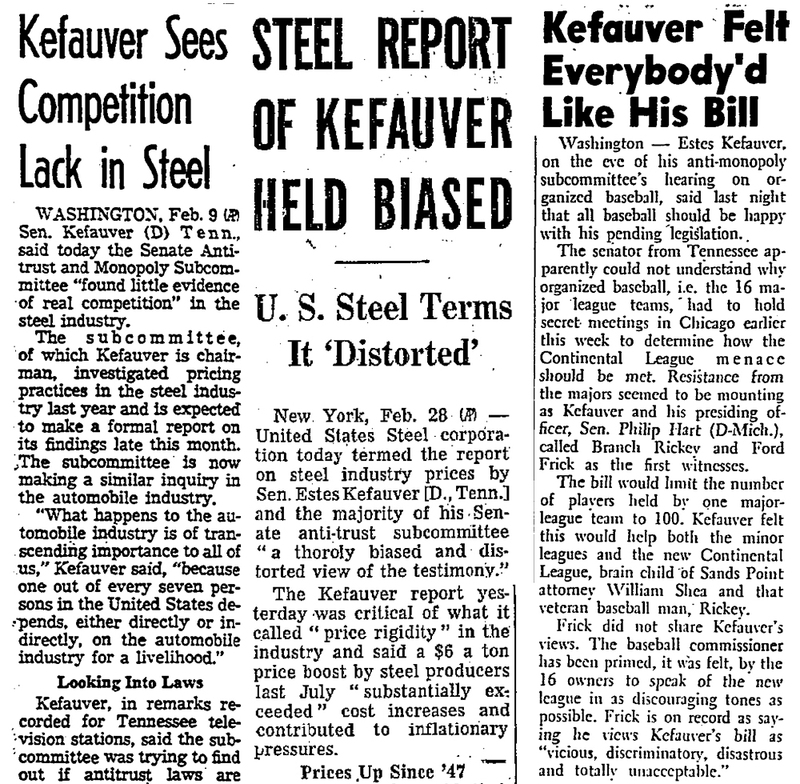 Kefauver issued subpoenas to twelve steel companies for production-cost data, but four executives refused to comply. The steel episode was monumental. It revealed how government could thwart the kind of price collusion that leads to concentration and consolidation, the antithesis of a free market. The same year, Kennedy signed into law a bill that gave the Department of Justice authority to compel production of records in civil cases, not just criminal ones, strengthening consumer welfare. The administration also investigated the meat, milk, pharmaceutical, flour, automobile, petroleum, metals, and other industries for price-fixing. But monopolies persisted. During the Kennedy-Johnson era, only 115 of thousands of mergers were challenged. When the legislative and executive branches failed to take action, the courts stepped in. The first interpretation of the Celler-Kefauver Act would prove to be a landmark case in merger jurisprudence, though decades later, its consumer welfare tenets would become less pronounced. In Brown Shoe (1962), a merger between two shoe manufacturers was shut down because it would prevent “rivals of a fair opportunity to compete” in retail and manufacturing. The populist ruling lessened industry concentration while protecting competition and consumers. Business Week wondered whether “any mergers at all can now hope to escape the heavy hand of the Justice Department.” The precise factual and legal analysis given to every challenged merger to identify anticompetitive effects relies on this ruling to this day. The same year, Kefauver threatened to become a walking cliché after years of exhaustive—and exhausting—hearings. The senator who at times was perceived as a publicity monger, succeeded in getting a drug safety bill, the Kefauver-Harris Amendment to the FDA Food, Drug and Cosmetic Act of 1938, passed. During the hearings, the pharmaceutical industry was accused of engaging in a “numbers racket” and “starry-eyed promotion” in introducing a parade of “wonder drugs.” The landmark legislation was passed partly in response to the Thalidomide tragedy in Europe, where birth defects resulted in children of mothers who took the drug while pregnant. In August 1963, Kefauver had a fatal heart attack on the floor of the Senate. Obituaries emphasized his failed pursuits of the presidency and vice presidency and his crusade against organized crime over his years as a monopoly hunter. In a 1971 New York Times Book Review article, critic Robert Sherrill wrote that Kefauver’s tenure as chair of the subcommittee was his greatest accomplishment because “he brought to judgment an awesome range of corporate evildoers, especially the pharmaceutical industry.” A year later, Senator Philip Hart, who was more sympathetic to big business, was appointed head of the subcommittee. The work continued, but with less fanfare. The subcommittee was abolished in 1979 when Senator Edward Kennedy was chair. Yet Kefauver’s allies would continue to ensure the preservation of his legacy. At Kefauver’s urging, in February 1961, President Kennedy had nominated Paul Rand Dixon, the subcommittee’s counsel and staff director, to run the Federal Trade Commission. According to James Williamson’s Federal Antitrust in the Kennedy-Johnson Years, Dixon was a political animal who nonetheless pushed Kefauver’s agenda when possible. Yet there was little political will for significant anti-monopoly enforcement in the 1960s and 1970s, and Dixon followed the Kennedy-Johnson era’s tepid approach to antitrust. As the Wall Street Journal reported in 1963, “It’s no secret that the administration has been trying to convince the business community it has nothing to fear from Washington.” But Dixon did manage to crack down on “unfair and deceptive practices” in advertising, auto financing, food, drugs, and cosmetics. He instituted public health warnings on cigarettes and ended tobacco advertising on television. The FTC set up federal standards for tires and fought price-fixing in antibiotics, dairy, and bread. It investigated car warranties and real estate ads that discriminated against African Americans. Dixon urged states to pass “truth in advertising” laws that weren’t being passed at the federal level. According to its 1963 fiscal year report, the FTC had addressed 431 antimonopoly complaints, cutting down on illegal business practices. Despite Dixon’s trailblazing on certain issues, Ralph Nader attacked Dixon for his support of voluntary compliance and self-regulation. Kefauver himself had not rejected such measures, but Nader saw them as ineffective; the disagreement led Dixon to slur Nader by calling him a “dirty Arab.” (Dixon subsequently apologized.) Some have argued that Nader was the true inheritor of Kefauver’s mantle. Far more successful than the senator in achieving tangible wins, Nader brought attention to safety defects in cars, specifically the Corvair, and helped push Congress to pass the 1966 National Traffic and Motor Vehicle Safety Act. He helped create the Occupational Safety and Health Administration, the Environmental Protection Agency, the Consumer Product Safety Commission, and the Safe Drinking Water Act, among other regulatory achievements. In 1964 the U.S. Department of Justice charged U.S. Steel, Bethlehem Steel, and six other producers with conspiring to fix prices from 1955 to 1961. The indictment was the sixth major antitrust case against the steel industry in two years. Bethlehem Steel called the alleged practices “ancient history.” Kefauver would have been pleased by the charges, if not at all surprised. The 1980s and 1990s saw more mergers and consolidation, and price-fixing cases became a regular feature of antitrust enforcement. The government’s successful antitrust cases against IBM, AT&T, and Microsoft arguably led new technologies to emerge in the 2000s and beyond. Large companies and conglomerates proliferated. Kefauver might not approve of today’s economic landscape, but he would recognize it. This essay was supported by the Economic Hardship Reporting Project. Jill Priluck is a writer, editor, and lawyer who lives in New York City. Her reporting and analysis have appeared in The New Yorker, Slate, The New York Times Magazine, Reuters, and elsewhere.